I love the Automat series so after a while I looked a little further to see what happend after the Automats, AM's, AM2's... well there was the AM3, but only a dozen or so were made so..
KMZ recognized that the Automats had their limitations so they came up with the APK. An enhanced Automat if you will. Two shots of the APK. 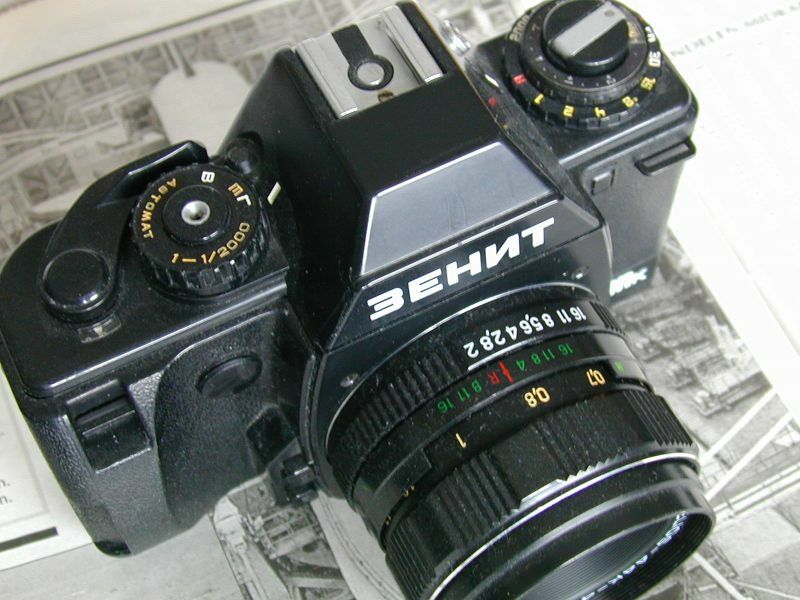 The styling looks a little like the Zenit-122. Same ergonomic grip on the side (which also houses the batteries. 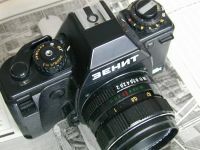 The back, allthough not seen here has a Zenit-122 type door. But sofar nothing strange right? One shot of the front and one of the top, the simple select dail, off (L) E for on and B. The other dail controls speed (A for Aperture priority program) all others for manual control. Impressive. Normal by todays standards. As with all Automats this is an easy camera. Just set the camera to A and you only have to focus and to choose your aperture. It is odd that only around 7000 have been made. The camera handles great and the grip is an improvement over the Automat, viewfinder is big and uncluttered since there are only 3 leds in the whole camera. There is however no selftimer, the places for the knob and the led are there but the mechanism isn't. Probably cost effectiveness... Actually you can't say much about the APK, it simply is a great usercamera and a worthy successor to the Automatseries. In fact I would choose the APK over the newly developed KM/KM plus simply because of all the problems of the early KM's. But to say that the APK is without faults would be wrong, there are no cameras without faults. As with all Russian cameras the electronics are vulnerable. Usually these are just bad solderings but still. Again like we've seen it on the 18, 19 and the Automats, their electronics are their weak points. 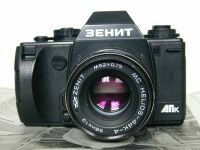 But if you get a good one (and I have) you've got a camera that can not only take a beating but one that is very cheap and offers all the basic features PLUS a very good standard lens. People often overlook how good the Helios lenses are and if you get a Zenitar K2 you've got something good in your hands. Allthough APK's and Automats can be a gamble every now and again, so allways get one from a good seller, you get a K-camera for UNDER a 100 dollars, about 90 euros. Which is a very very cheap and good entry in the world of K-bayonet.